Elton View Fishing Park is 2kms outside the seaside town of Cha-am, about 30kms from Hua-Hin. The park has 3 lakes available to fish with different prices and species to catch. Besides the long clean beach there are many attractions close to the park for family fun including Santorini Water Park, Swiss Sheep Farm and Camel Republic. We have a small restaurant area, a bar with Pool table and Dart board and a fishing tackle shop selling bait and items of tackle. We have rods for rent to suit each lake and style of fishing as well as items to get you through your day including snacks and cold drinks. Wifi is also available. Siamese Carp from 6kg to 45kg with around 500 in total. 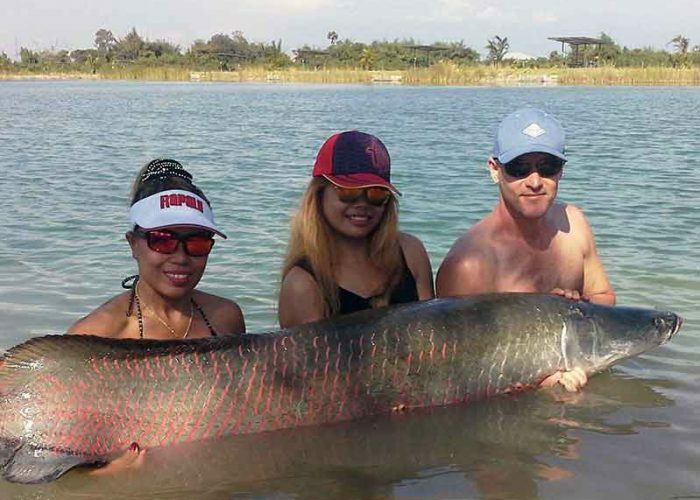 There are also many Amazon Redtail upto 20kg, a small number of Mekong Catfish from 20kg to 80kg, Arapaima to 80kg, Pacu to 12kg, 50 common carp around 10kg. Over 200 Snakehead, Yeesop and approx 50 Chinese big head carp around 4-6kg. Varied other exotic species. We have a small restaurant area, a bar with Pool table and Dart board and a fishing tackle shop selling bait and items of tackle. We have rods for rent to suit each lake and style of fishing as well as items to get you through your day including snacks and cold drinks. Wifi is also available. We have teamed up with Panorama Hill resort approximately 200 mtrs from the fishery. The resort has varied accommodation and the price includes the use of the 2 swimming pools and small gym.